Heavy storms on Friday dumped several inches of rain on the Charleston area, inundating low-lying spots with floodwaters and jamming traffic during the morning rush hour. With more rain expected during the evening commute and overnight, officials warned residents to be prepared for the possibility of more flooding on Saturday. The bulk of the rain, however, appeared to have fallen on Friday. Between 2 and 3 inches had fallen by late morning on areas from Johns Island to northern Mount Pleasant, easily shattering a daily record of 1.79 inches set in 1977 at the Charleston International Airport, according to the National Weather Service's Charleston office. An additional 1 to 2 inches could fall overnight, bringing potential rain totals up to 5 inches, said Steve Rowley, a meteorologist with the Weather Service's Charleston office. Locally higher precipitation amounts were also forecast as possible for overnight Saturday, Rowley said. "If the rain's falling like that, we'll have similar problems (to Friday)," he said. After Saturday morning, forecasters expect the rain to taper off, Rowley said. Conditions will be cloudy by noon and chances of rain will drop to less than 10 percent by late afternoon. Temperatures will remain in the mid-60s to low-50s through Sunday. Weather Service officials would continue to monitor conditions and issue watches or warnings as needed, he said. Some of the heaviest rain on Friday fell during the morning commute. People heading to work and parents driving their children to school struggled to navigate streets swollen with water, and crews closed dozens of intersections in Charleston — mainly on the peninsula — and in North Charleston. From West Ashley's Avondale to neighborhoods in Summerville, water filled drainage ditches and accumulated in yards. Brenda Peart, a Charleston resident, stood at the submerged intersection of King and Huger streets and recorded frequent updates on her phone, calling the area "lakefront property" in one clip. Videos she posted to social media showed the flooding slowly subside as the afternoon wore on. "When you begin to see the yellow lines in the street," she said with a laugh, "that’s when you know waters have been receding." After the flash flood warning ended, police officers continued to direct traffic on waterlogged thoroughfares such as Septima P. Clark Parkway, widely known as the Crosstown. Small cars stalled on flooded streets. Passing trucks kicked up waves to the frustration of residents worried about water reaching their homes and businesses. After Friday morning’s headaches, crews in Charleston prepared for another round of possible flooding by deploying barricades and high-water vehicles in West Ashley. On the peninsula, portable pumps capable of moving 2,300 gallons of water a minute were positioned at four flood-prone intersections. "They've been in use all day," Shannon Scaff, the city’s emergency management director, said of the pumps. "That rainfall (Friday) morning was so heavy and concentrated in certain areas that we had significant ponding." The morning's flooding left many in the tri-county area with a mess to clean up. The Holiday Festival of Lights at James Island County Park was called off Friday night due to flooding, marking only the second cancellation in 29 years, Charleston County Parks said. For the fourth time this year, Summerville shelter Dorchester Paws closed its doors to deal with 5 to 9 inches of standing water in the facility’s parking lot and yards. The kennel scrambled to find temporary foster homes. In outer West Ashley, Pastor Paul Rienzo of Crosstowne Church thought he would spend the morning preparing for the evening’s annual Christmas celebration honoring the church’s volunteers. Instead, volunteers helped him haul furniture and electronics out of the sanctuary on Bees Ferry Road as Church Creek spilled over its banks and edged into the church’s parking lot. With more rain in the forecast, Rienzo expected the building to flood for the fourth time since 2015. 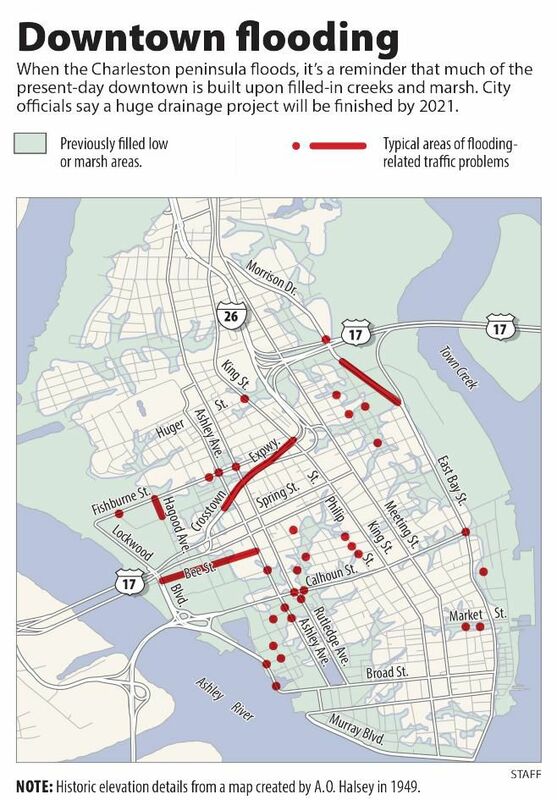 The church hired a stormwater engineer to study flood patterns in that part of the drainage basin, which is one of the worst flooding spots in the Lowcountry. Rienzo said the research confirms that Church Creek can’t handle how much stormwater runoff feeds into it from the massive cluster of subdivisions, roads and businesses surrounding it. Friday morning’s flooding was another example, given that the creek began to rise well before high tide around 12:30 p.m.
Rienzo anticipated any damages to be disruptive and costly. If the water penetrates the drywall and repairs are needed again, it’s possible the rest of the Christmas season at the church will be ruined as well. “This really is a bad time to hit us,” he said. Glenn Smith, Gregory Yee and Hannah Alani contributed to this report. Reach Abigail Darlington at 843-937-5906 and follow her on Twitter at @A_Big_Gail. Reach Angie Jackson at 843-937-5705. Follow her on Twitter at @angiejackson23. If another inch and a half of rain falls in the Church Creek basin in outer West Ashley, it's highly likely that the creek will overflow and flood Crosstowne Christian Church for the fourth time since 2015.